The Strategic Petroleum Reserve (SPR), filled to capacity at 727 million barrels, is the world's largest supply of emergency crude oil. The federally-owned oil stocks are stored in huge underground salt caverns along the coastline of the Gulf of Mexico. Decisions to withdraw crude oil from the SPR are made by the President under the authorities of the Energy Policy and Conservation Act. In the event of an energy emergency, SPR oil would be distributed by competitive sale. The SPR has been used under these circumstances only twice (during Operation Desert Storm in 1991 and after Hurricane Katrina in 2005). Its formidable size (700-plus million barrels) makes it a significant deterrent to oil import cutoffs and a key tool of foreign policy. The need for a national oil storage reserve has been recognized for at least five decades. Secretary of the Interior Harold Ickes advocated the stockpiling of emergency crude oil in 1944. President Truman's Minerals Policy Commission proposed a strategic oil supply in 1952. President Eisenhower suggested an oil reserve after the 1956 Suez Crisis. The Cabinet Task Force on Oil Import Control recommended a similar reserve in 1970. But few events so dramatically underscored the need for a strategic oil reserve as the 1973-74 oil embargo. The cutoff of oil flowing into the United States from many Arab nations sent economic shockwaves throughout the Nation. In the aftermath of the oil crises, the United States established the SPR. President Ford set the SPR into motion when he signed the Energy Policy and Conservation Act (EPCA) on December 22, 1975. The legislation declared it to be U.S. policy to establish a reserve of up to one billion barrels of petroleum. The Gulf of Mexico was a logical choice for oil storage sites. More than 500 salt domes, known to be an inexpensive and secure means of petroleum storage, are concentrated along the coast. Also, the Gulf Coast is the location of many U.S. refineries and distribution points for tankers, barges and pipelines. In April 1977, the government acquired several existing salt caverns to serve as the first storage sites. Construction of the first surface facilities began in June 1977. On July 21, 1977, the first oil - approximately 412,000 barrels of Saudi Arabian light crude - was delivered to the SPR. Fill of the Nation's emergency oil reserve had begun. Purchases totaling 591.7 million barrels were completed by the end of 1994. However, beginning in FY 1995 until January 2009, direct purchase of crude oil was suspended in order to devote budget resources to refurbishing the SPR equipment and extending the life of the complex through at least the first quarter of the 21st century. Fill was resumed in 1999 using a joint initiative between the Departments of Energy and the Interior to supply royalty oil from Federal offshore tracts to the Strategic Petroleum Reserve. This arrangement is known as the Royalty-in-Kind (RIK) program and continued in phases from 1999 through 2009, when the Department of the Interior discontinued its RIK program. The first direct purchase of crude oil since 1994 was conducted in January 2009 using revenues available from the 2005 Hurricane Katrina emergency sale. DOE purchased 10.7 million barrels at a cost of $553 million. Stockpiling crude oil in the SPR reduces the nation's vulnerability to economic, national security, and foreign policy consequences of petroleum supply interruptions. The SPR proved its value in 1991 when a partial drawdown, coupled with a coordinated international supply response, help restore stability to world oil markets during the Persian Gulf War. On January 16, 1991, coinciding with the international effort to counter the Iraqi invasion of Kuwait, President George H.W. Bush ordered the first-ever emergency drawdown of the SPR. The Department of Energy immediately implemented a drawdown plan to sell 33.75 million barrels of crude oil, the United States' portion agreed to by the International Energy Agency. The drawdown proceeded on schedule and without major complications. Between the initial authorization and the final sale, however, world oil supplies and prices stabilized, and the United States reduced the sales amount to 17.3 million barrels which were sold to 13 companies. The SPR's second emergency drawdown occurred after Hurricane Katrina caused massive damage to the oil production facilities, terminals, pipelines, and refineries along the Gulf regions of Mississippi and Louisiana in late August 2005. All Gulf of Mexico production was shut in initially, which equated to about 25% of domestic production. Gasoline prices spiked nationwide in reaction to the disruptions, and the supply levels of gasoline and other refined products were impacted. action with the International Energy Agency, President George W. Bush issued a Finding of a Severe Energy Supply Interruption and directed the Secretary of Energy to draw down and sell crude oil from the SPR. Secretary Samuel W. Bodman immediately authorized a Notice of Sale for 30 million barrels of crude oil to the U.S. markets. The on-line sale was held from September 6-9, 2005. DOE evaluated each bid and determined that five companies had submitted acceptable offers for 11 million barrels. In announcing the sale results, Secretary Bodman stated, "This sale ensures that refineries have the petroleum they need to keep gasoline and diesel fuel flowing to American consumers while production facilities in the gulf region regain their capacity. As we move forward, we will continue to minotor the overall supply of petroleum available and the needs of the nation as we determine next steps." In managing the Strategic Petroleum Reserve Program, the Office of Fossil Energy's overriding objective is to maintain the readiness of the oil stockpile for emergency use at the President's direction. From 1993-2000, the Department of Energy's top priority was to ensure the continued readiness of the Reserve through at least the year 2025 by conducting a major life-extension program. 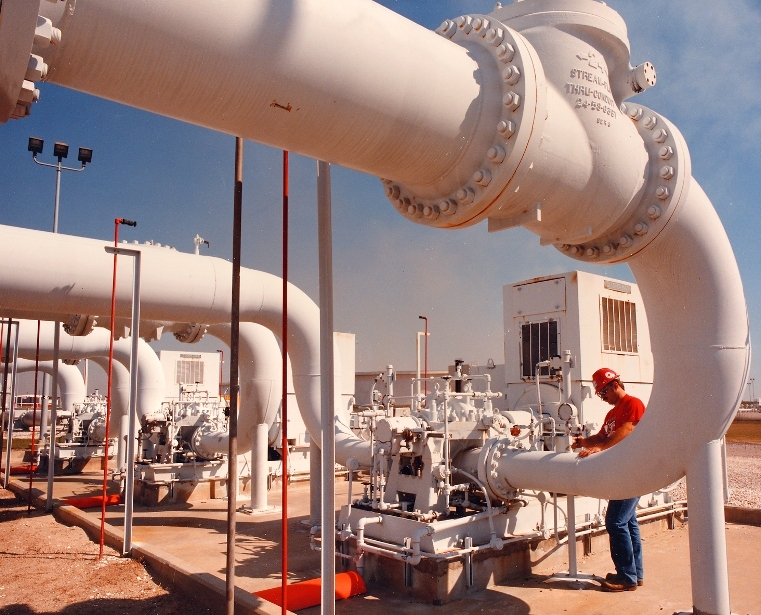 This included replacing or refurbishing pumps, piping and other key components at the SPR's Gulf Coast sites. The program was completed in March 2000 on schedule and below original cost estimates. In 2005, Congress directed the SPR to take actions to fill to its authorized size of one billion barrels. Because the Reserve currently has a physical capacity of 727 million barrels, the SPR prepared a plan to aexpand to one billion barrels nd conducted a site selection process to construct additional storage facilities. Emergency crude oil is stored in the Strategic Petroleum Reserve in salt caverns. Created deep within the massive salt deposits that underlie most of the Texas and Louisiana coastline, the caverns offer the best security and are the most affordable means of storage, costing up to 10 times less than aboveground tanks and 20 times less than hard rock mines. 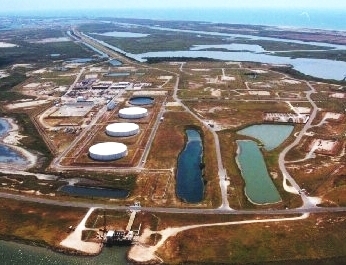 Storage locations along the Gulf Coast were selected because they provide the most flexible means for connecting to the Nation's commercial oil transport network. Strategic Reserve oil can be distributed through interstate pipelines to nearly half of the Nation's oil refineries or loaded into ships or barges for transport to other refineries. Strategic Petroleum Reserve caverns range in size from 6 to 35 million barrels in capacity; a typical cavern holds 10 million barrels and cylindrical in shape with a diameter of 200 feet and a height of 2,000 feet. One storage cavern is large enough for Chicago's Sears Tower to fit inside with room to spare. The Reserve contains 62 of these huge underground caverns. Salt caverns along the Gulf Coast have been used for storage for many years by the petrochemical industry. When the U.S. Government decided to create the Strategic Petroleum Reserve in the mid-1970s, it acquired previously created salt caverns to store the first 250 million barrels of crude oil. This was the most rapid way to begin securing an emergency supply of crude oil following the oil shocks of the 1970s. To stockpile oil beyond the first 250 million barrels, the Department of Energy created additional caverns. Salt caverns are carved out of underground salt domes by a process called "solution mining." Essentially, the process involves drilling a well into a salt formation, then injecting massive amounts of fresh water. The water dissolves the salt. In creating the SPR caverns, the dissolved salt was removed as brine and either reinjected into disposal wells or more commonly, piped several miles offshore into the Gulf of Mexico. By carefully controlling the freshwater injection process, salt caverns of very precise dimensions can be created. For every barrel of crude oil to be stored in the SPR's salt caverns, it took 7 barrels of water to create the storage space. Besides being the lowest cost way to store oil for long periods of time, the use of deep salt caverns is also one of the most environmentally secure. At depths ranging from 2000 to 4000 feet, the salt walls of the storage caverns are "self-healing." The extreme geologic pressures make the salt walls rock hard, and should any cracks develop in the walls, they would be almost instantly closed. An added benefit of deep salt cavern storage is the natural temperature difference between the top of the caverns and the bottom, a distance of around 2,000 feet. The temperature differential keeps the crude oil continuously circulating in the caverns, maintaining the oil at a consistent quality. The fact that oil floats on water is the underlying mechanism used to move oil in and out of the SPR caverns. To withdraw crude oil, fresh water is pumped into the bottom of a cavern. The water displaces the crude oil to the surface. After the oil is removed from the SPR caverns, pipelines send it to various terminals and refineries around the nation. Here’s a brief history of the Strategic Petroleum Reserve, world's largest emergency supply of crude oil. 1944: Secretary of the Interior Harold Ickes advocated the stockpiling of emergency crude oil. 1952: President Truman's Minerals Policy Commission proposed a strategic oil supply. 1956: President Eisenhower suggested an oil reserve after the Suez Canal crisis. 1970: A Cabinet Task Force on Oil Import Control recommended a similar reserve. 1973-74: The cutoff of oil flowing into the US from many Arab nations sent economic shockwaves throughout the nation. 1975: President Ford signed the Energy Policy and Conservation Act on December 22, establishing a reserve of up to one billion barrels of petroleum. 1977: The government acquired several existing caverns in salt domes to serve as the first storage sites. Sandia’s involvement in the reserve begins. 1977: On July 21 the first oil — approximately 412,000 barrels of Saudi Arabian light crude — was delivered to the reserve. 1991: On January 16, coinciding with the international effort to counter the Iraqi invasion of Kuwait, President George H.W. Bush ordered the first-ever emergency drawdown. 1995: Officials suspended filling the reserve to devote budget resources to refurbishing equipment and extending the life of the complex. 1999: Filling resumed with royalty oil from federal offshore tracts. 2001: In November, President George W. Bush ordered the SPR to be filled to approximately 700 million barrels by producers, who operate leases on the federally owned outer continental shelf. 2005: On August 8, President Bush signed the Energy Policy Act of 2005 directing the Secretary of Energy to fill the reserve to its authorized one billion barrel capacity. 2005: In late August, the SPR's second emergency drawdown occurred after Hurricane Katrina caused massive damage to the oil production facilities, terminals, pipelines, and refineries along the Gulf regions of Mississippi and Louisiana.